Jennifer Reid Egbe is no stranger to breaking down barriers. She was one of the first attorneys in her family and the first African American female in the firm to make partner. While her persistence and unrelenting stamina has served her well in her career, it has served her clients even better. Since joining the firm in 2007, Jennifer has earned the respect, loyalty and trust of those she stands up for every day. And, she has earned a trial record that strikes fear into anyone who stands against them. Specializing in the areas of automotive product liability, medical malpractice and employment litigation defense, Jennifer has served on trial teams that have multiple defense verdicts, summary judgment phase dismissals and appellate victories. 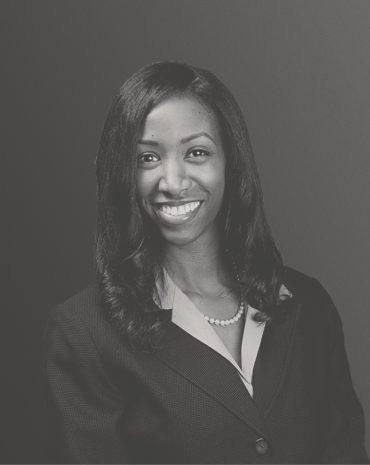 Her individual litigation practice runs the spectrum from case initiation through trial. Whether she is representing a Fortune 10 company or a start-up business, Jennifer tackles every case with the same unstoppable approach. Away from the office, Jennifer is involved in a number of community service programs and enjoys time with her husband, Anthony, and their young daughters, Tru and Charlotte. Jennifer earned her BA from The University of North Carolina at Chapel Hill and her JD from Cumberland School of Law at Samford University. Co-author of “The Application of Seat Belt Laws in Automotive Trials”; published by the Defense Research Institute.